If a matzo ball lands in broth and no one's there to compare it to their grandmother's, did that bowl of soup exist at all? Something about a Jewish-style deli brings out the fight in us. Many claim that the #19 at Langer's is the best pastrami sandwich on the planet. Others insist Brent's in Northridge holds the title. Are the matzo balls at Canter's heinous and rock-hard or deliciously firm? Comparing delis to each other is as much of a tradition as their long menus, their complimentary half-sour pickles and pastrami piled high on rye bread. Like many European immigrants, the delicatessen came to the United States through New York, according to David Sax, author of the 2009 book Save the Deli: In Search of Perfect Pastrami, Crusty Rye and the Heart of Jewish Delicatessen. The New York deli saw its heydey in 1920s and '30s. Now, Los Angeles is America's premier deli city. Fighting words, we know. From the San Fernando Valley to the Westside, from the Eastside to MacArthur Park, no matter where you are in L.A., odds are you're close to one of these palaces of nostalgia and comfort food. Namesake Art Ginsburg passed away in 2013 but his son Harold has taken the reins at Art's Delicatessen, where "every sandwich is a work of art." Opened in 1957, it's known for its hot pastrami and traditional Reubens as well as its friendly atmosphere. No surly wait staff here. Instead you'll find would-be actors chatting you up and a warm welcome for dogs, as long as they stay on the sidewalk patio. The omelet with corned beef, pastrami and salami is fun way to sample all the meats at once. Many items are available in lighter portions (for a reduced price), along with vegetarian dishes such as a veggie Reuben and vegetable soup. 12224 Ventura Blvd., Studio City. 818-762-1221. Often considered the second-best deli in Southern California (behind Langer's) the valley's not-so-secret treasure has been busier than ever. Weekend lines at Brent's Deli snake along the sidewalk in front of its strip mall parking lot. 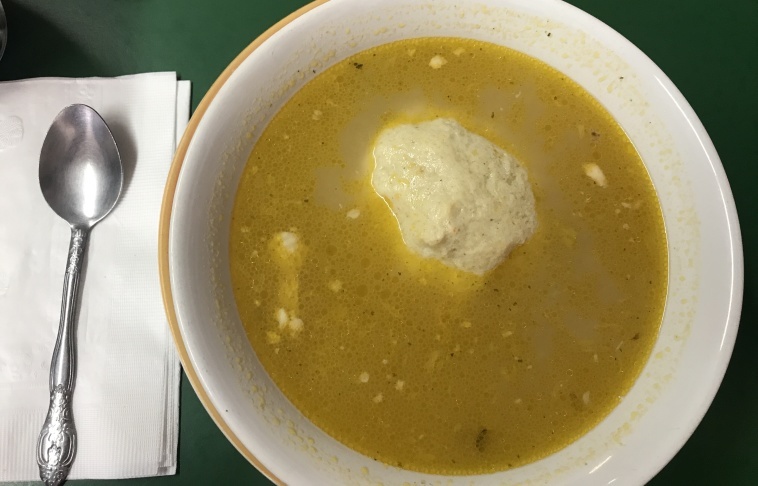 Owned and operated by the Perskin family since 1969, the restaurant makes a matzo ball soup loaded with shredded chicken and one oversized ball. The blintzes are lightly brown and the thinly cut black forest pastrami offers a great blend of fat and lean meat on fresh, house-baked rye. 19565 Parthenia St., Northridge. 818-886-5679. Canter's has been one of the anchors on this ever-changing stretch of Fairfax Avenue since 1953. After some changes in 2018, the bakery and take-out deli are still open 24/7 while the dining room closes at 3 a.m. on weeknights. You know what to expect here: Slightly surly servers and a mix of senior citizens, Supreme-shopping hipsters, rock 'n' roll fans and tourists, who come for the deli standards. The half-sours are firm. The matzo ball soup, which features one large, hard, softball-sized ball, comes with a basket of toasted bagel chips. The house-baked rye bread is lightly crunchy. You can smell the fresh baked treats as you walk in the door. Just a half-mile from the Sunset Strip, Canter's is also known for its rock and roll history. Slash of Guns N' Roses and members of the Red Hot Chili Peppers were friends of owner Marc Canter and have been frequent guests, either at the restaurant or at the adjacent Kibbitz Room bar. Even Barack Obama stopped in for a nosh in 2014. 419 N. Fairfax Ave., Fairfax. 323-651-2030. In a strip mall in the heart of the Sunset Strip, Trisha Langer — the granddaughter of that Langer — serves next generation versions of her parents' and grandparents' favorites. Order at the counter, grab a seat out front and they'll bring the food to your table. (There is also limited seating inside.) Daughter's version of Langer's #19, the Papa, is filled with that familiar thick-cut Langer-style pastrami, sweet slaw, Swiss cheese and homemade Russian dressing on a tasty, tough-edged rye. The Nana is similar, with corned beef and sauerkraut. You can also try blintzes, matzo ball soup, a lox plate and other deli faves. The grilled cheese is served on challah while the egg creams come in chocolate and vanilla. 8555 Sunset Blvd., West Hollywood. 310-652-6552. 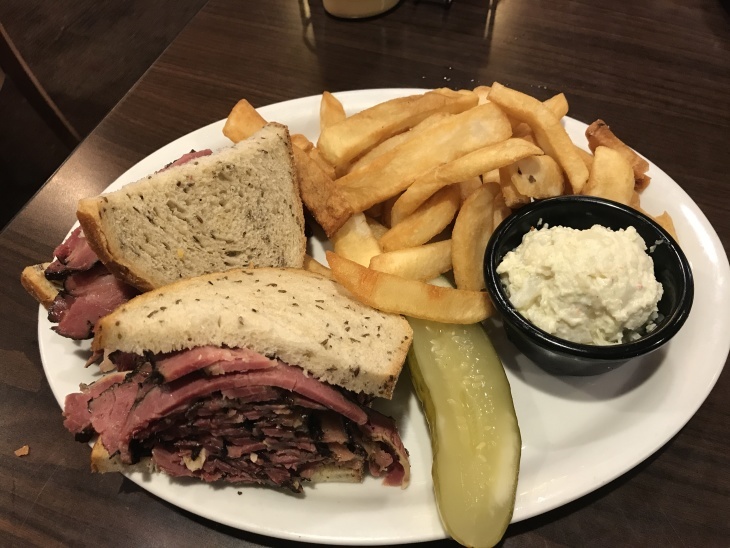 While most delis are family-friendly, Factors takes it a step further with an extensive kid's menu, ride-on machines out front and a super kid-centric atmosphere. Opened in 1948, it has been overseen by the Markowitz family since 1969. Expect large portions and crunchy pickles. Highlights include crisp potato pancakes, kreplach (dumplings) and sky high sandwiches of pastrami, roast beef and brisket. Newer items include an extra large chopped salad and a few surprisingly good Tex Mex items like fajitas and a soft taco plate. The hand-cut pastrami is thick and juicy and the fresh-baked breads are soft. 9420 W. Pico Blvd., Pico-Robertson. 310-278-9175. Not quite a deli but not quite anything else, Freedman's opened in an Echo Park strip mall in 2017, showcasing chef Liz Johnson's deli-inspired gourmet food. The menu changes according to the time of day — there's no pastrami or matzo balls on the brunch menu — but if you're craving pickles, just ask. All the meats and fish are smoked in-house. Bagels are made fresh each morning, producing balls of dough with a thin layer of firm crust and a light, airy center. The smoked salmon and post-modern scrambled eggs come with a waffle iron-formed potato "latke" that's crisp on the outside and soft inside, served with eggs and thinly sliced salmon. The chocolate babka is a glorious sticky bun covered in gooey sugary caramel. At dinner, you can order matzo ball soup served in a grandma-style tureen and brisket for four, cut tableside with an electric carving knife. The food is fresh and inventive, offering a new take on old favorites. 2619 Sunset Blvd., Echo Park. 213-568-3754. Once a chain of five restaurants stretching from the San Fernando Valley to Palm Springs, Fromin's scaled back in 1990, keeping only the Santa Monica location. Founder Dennis Fromin still runs the restaurant. 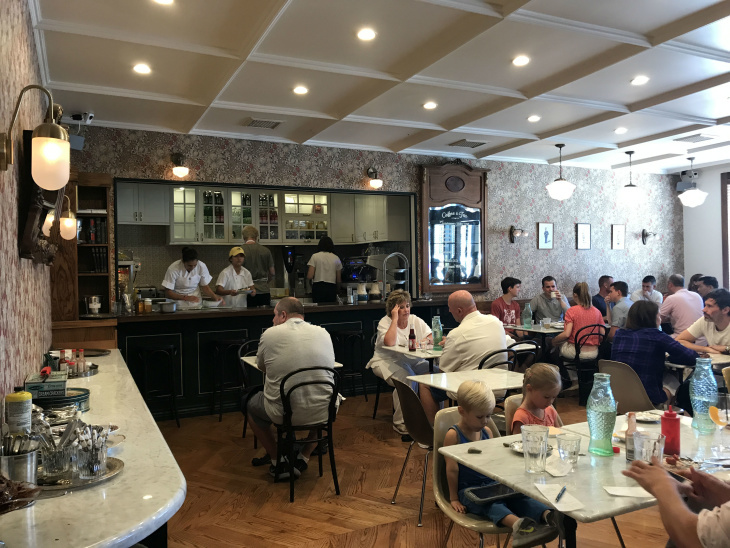 You'll find an extensive menu — nine pages in all, with plenty of sandwich and fish options, latkes, blintzes, soups, herring, gefilte fish, borscht and chopped liver. The egg creams and chocolate phosphates are totally vintage but the avocado toast is riding the millennial wave. Breakfast is served all day, which is helpful because the cinnamon loaf French toast — thick slices of cinnamon roll transformed into eggy pan-fried toast then dusted with powdered sugar — can be a bit rich for the A.M.
1832 Wilshire Blvd., Santa Monica. 310-829-5443. When this deli first opened in 1926, Sunset Boulevard was a dirt road. 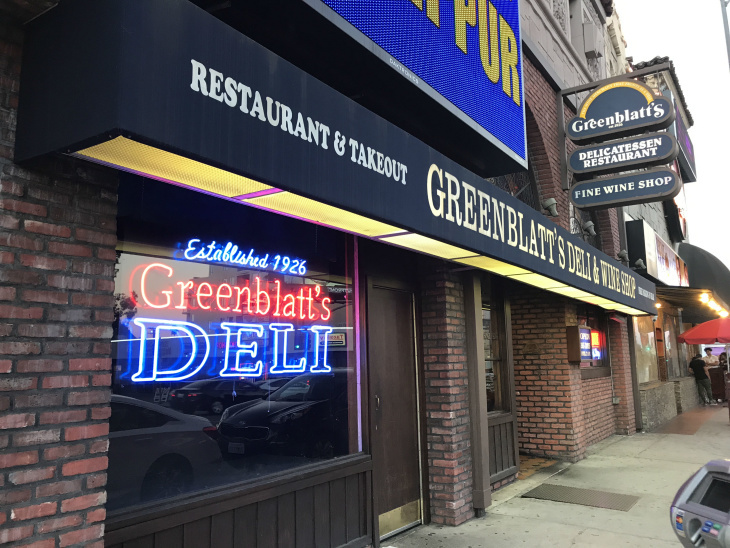 Greenblatt's has been in its current location near Crescent Heights since 1946 and is probably L.A.'s oldest deli. The main floor holds the meat counter plus an extensive wine shop. There are a few booths down here but the larger dining room is upstairs. 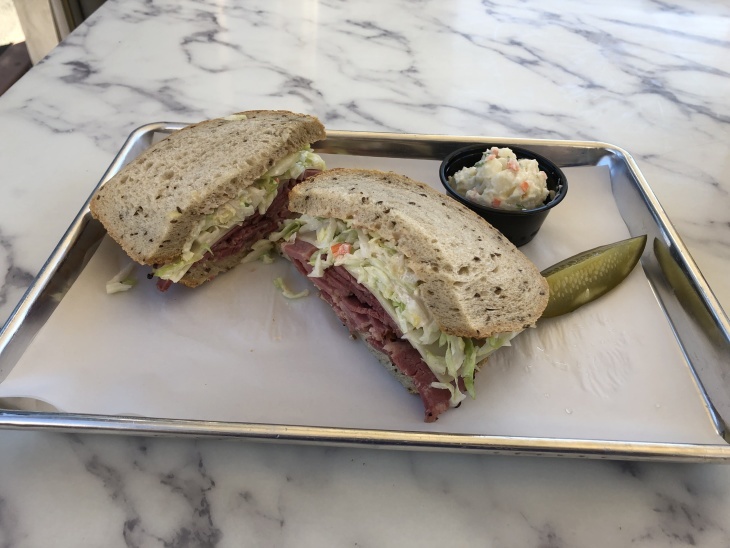 Their pastrami is on the lean side and comes with a whole pickle and your choice of one side — a bag of Kettle potato chips, creamy macaroni salad, house made slaw or potato salad. Go for the slaw. Greenblatt's does a lot of takeout so call ahead. It's open until 2 a.m. daily, making it the perfect pit-stop after a set at the Laugh Factory next door. 8017 Sunset Blvd., West Hollywood. 323-656-0606. Izzy's Deli debuted in 1973 and is still run by its original owner, Izzy Freeman, along with his family. It's open 24 hours and calls itself both the "deli to the stars" and the "home of the overstuffed sandwich." That's true on both counts. Star sightings are supposedly common and the pastrami and corned beef sandwiches come loaded with meat. The potato salad is especially creamy and smooth. Located at the corner of Wilshire and 16th Street, Izzy's dining room is lined with large windows on two sides making it feel open and airy. Judith's Mish Mash Soup, a bowl of broth loaded with noodles, kreplach and a matzo ball, is the ideal sick-day remedy. 1433 Wilshire Blvd., Santa Monica. 310-394-1131. Just a block from Factor's on Pico, Label's Table has been quietly serving sandwiches, soups and sides to a busy lunch crowd since 1974. Still run by its original owner, Bruce Krakoff, this is a no-nonsense, no-frills, lunch-only spot. Order from the menu board and wait for your number, then bring your red plastic tray of food to one of the long tables. The quality is good and the prices are reasonable (for a deli). 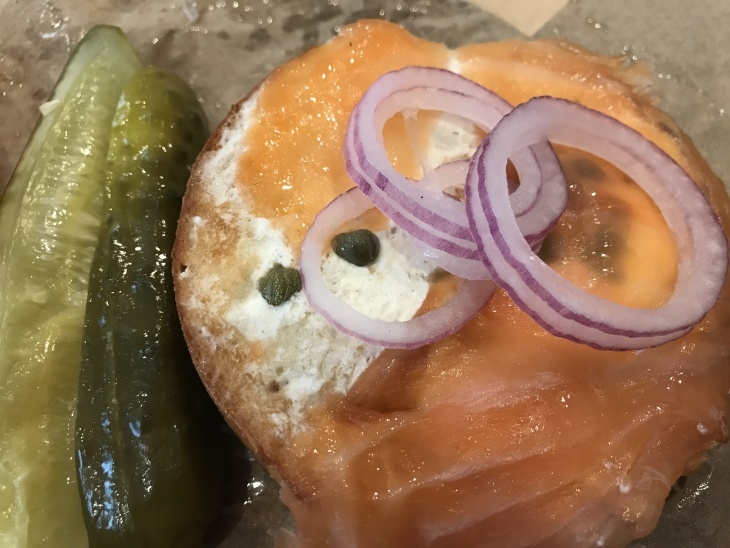 The #2 fish brunch comes with a bagel cut into quarters, slathered in cream cheese, draped with lox and lined up in a horizontal stack with tomato, onion, olives and a pickle. 9226 W. Pico Blvd., Pico-Robertson. 310-276-0388. The world's best #pastramI, in your hometown. Loads of famous fans including Nora Ephron and Jonathan Gold say Langer's makes the best pastrami sandwich. The James Beard Award-winning deli, located at a bustling corner opposite MacArthur Park, is most famous for its #19 — a sandwich piled with freshly cut pastrami, swiss cheese, coleslaw and Russian dressing on rye bread. Pair it with a vanilla or chocolate egg cream soda. Langer's is only open during the day and you should expect a wait at lunchtime. Weekends are less busy. Parking can be challenging so if you don't find a metered street spot, try the lot a block up on Wilshire; Langer's validates. 704 S. Alvarado St., Westlake. 213-483-8050. When Juniors closed in 2012, Lenny Rosenberg took over its West L.A. space, changed the name and kept the classics. He also introduced a selection of gluten-free and vegan items. Looking for a lox schmear on a gluten-free bagel? This is the place. 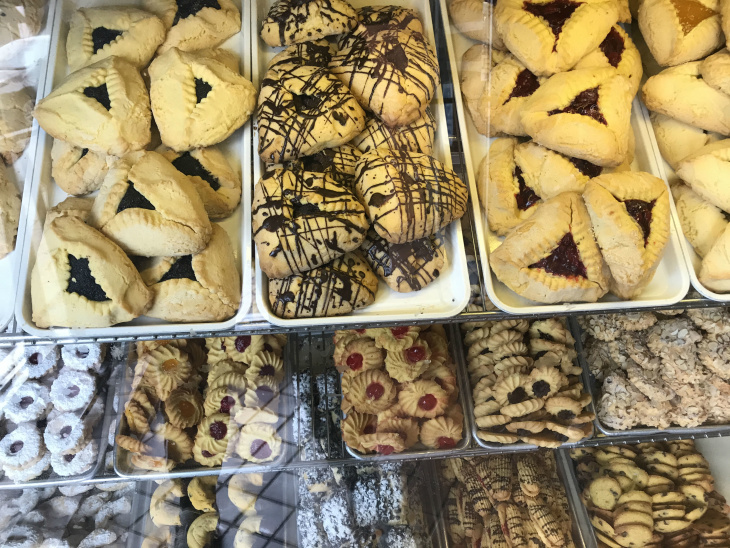 Lenny's has a large bakery offering regular and gluten-free cookies and breads, opposite a meat counter that does a brisk takeout and catering business. In the dining room, pastrami on rye comes with potato salad. It's cartoonishly thick and nicely spiced. The matzo ball soup comes with a single, large ball surrounded by noodles, cubed carrots, celery and plenty of chicken. Complimentary pickles are served with sauerkraut. While the current owners have been in talks to sell this Beverly Drive institution, preservationists are pushing the city council to designate Nate 'n Al's as a historic landmark. Opened in 1945 by Al Mendelson and made famous by long-time customers like Larry King, the deli is still owned and operated by the Mendelson family. Known for its snappy hot dogs, silver-dollar-sized potato latkes and house-baked rye, the booths are large and comfy and the vibe is family-friendly. They serve a minimalist matzo ball soup: a single, unadorned ball with only a few noodles to keep it company. Their meats are smoked in house while the lox is imported from the East Coast. 414 N. Beverly Dr., Beverly Hills. 310-274-0101. Relative newcomers in the deli world, Micah Wexler and Michael Kassar opened a stand in downtown L.A.'s Grand Central Market in 2014. An instant success, they branched out to Century City's Westfield mall and to a larger outpost in Santa Monica, the only location where you can get their matzo ball soup and their babka French toast with vanilla bean whip. At all three Wexler's locations, you order at the counter, Katz's style, and wait for your number to be called. The MacArthur Park pays homage to Langer's #19, piled with soft, lightly peppered, thick-cut pastrami that's tinged with clove and never feels soggy. The house-smoked lox (sold on bagels or by the pound) is mild, not that fishy or smoky, and provides a perfect foil for the cream cheese. 317 S. Broadway, downtown L.A. 213-620-0633. 616 Santa Monica Blvd., Santa Monica. 424-744-8671. 10250 Santa Monica Blvd., Century City. 310-203-9776. This story has been updated: An earlier version of the story included New York Famous Deli in Eagle Rock, which closed in October 2018. It has been removed.